ClickShare, the one click wonder, has been an extremely valuable product for many of our customers who are looking for an easy to use presentation and collaboration solution. 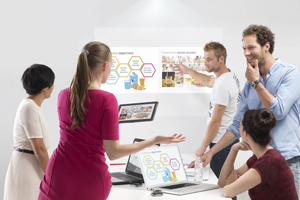 ClickShare solves many of the issues that so many customers have with meetings; the actual sharing of information. It is easily the most user friendly system to use when compared to other wireless presentation and collaboration tools. With a zero-IT footprint, using the ClickShare buttons on your laptop can be a breeze without the added IT support required from network administrators. The participants in a meeting can now effortlessly join in and present, share and collaborate with their peers, making the actual meeting more productive and engaging. With my primary background from the wireless realm of IT, I really appreciate the ClickShare’s autonomous integrated access point that is built in. Users have the option to either use the wireless access point built into the ClickShare, or make the ClickShare part of a company LAN and utilize their WLAN to access the unit. This can be advantageous in the sense that you minimize concurrent wireless devices that may cause interference within your own wireless network, thereby degrading the wireless speeds and achieved data rates. You are essentially competing for RF “air space” when you run a wireless access point in the vicinity of another wireless network. However, it can be equally advantageous for ClickShare integrators to run the built-in autonomous AP to run parallel to a company network. Too often A/V professionals are told, “You want to put an A/V project my corporate LAN? Not on my network!” With responses like these, you will soon see why using a Barco ClickShare has a huge advantage over its competitors. We can’t wait to see what 2016 has in store for Barco’s ClickShare! As many of you know, the Barco ClickShare technology has been a resounding success since its launch early 2013. I have spent a significant amount of time working very closely with our sales staff and our dealer channel in selling, designing, training and supporting the implementation of this product in just about every application you could think of. I’ve come to highly appreciate the strengths of this technology across the board. Its brilliance is only outshined by its simplicity. Over this period of time, Barco has made continuous improvements and performance enhancements to the technology and has pushed these out via firmware updates. Many of these updates have essentially flown under the radar. While some were significant in nature, none nearly as impactful as this most recent release on the CSC-1. And yes, while the ClickShare wireless architecture is head and shoulders above the competition when it comes to minimizing impact on IT infrastructures, it has never addressed how to at the same time allow for greater flexibility in this regard. And because of Apple legal limitations (not Barco’s fault), BYOD support with iOS was limited. All of this has changed… the proverbial gloves have officially been taken off! As of this latest release (which actually came out end of December) the CSC-1 now supports full mirroring from any iOS device by embedding native Airplay into the CSC-1 unit. Here is a YouTube video showing you how it works. This is a game changer!! With the MirrorOP app supporting full mirroring from Samsung tablets and phones and now with full iOS mirroring, true BYOD support is fully implemented. The other very powerful feature that has been launched in this release is the CSC-1 now has the ability to be integrated into a corporate network environment. What this means is IT departments, if they so choose, can now control the connectivity, security and throughput of the CSC-1 by pushing all the wireless traffic of the ClickShare buttons thru access points in the building and then over the base unit across the corporate network. Up until before this release, the ClickShare buttons were completely locked down. There was no option to deviate from this connectivity path. There are a number of other very important improvements that may be of interest. Here is a link to Barco’s website that calls attention to all of these updates. Please post your take on what your experience has been so far if you’ve had the chance to implement the new software. We’d love to hear from you. As some of you know from your experience so far, the Barco ClickShare technology is a smash hit. It not only delivers in easily solving wiring challenges in conference room settings, but most importantly, it greatly enhances the overall collaboration experience. I thought I would take this opportunity to share with you my experience and highlight a few key universal best practices when deploying a ClickShare system. First and foremost, know your environment! Yes it’s true that the ClickShare technology does not touch a corporate or facility’s LAN/WAN. However it does utilize encrypted WiFi to allow for the buttons to communicate to their assigned base station. This means there is the possibility of channel sharing with an existing wireless network in a given facility. Because of this, it is absolutely essential that you perform a WiFi sweep of the location on both the 2.4 and 5Ghz spectrums to determine where you may run into channel traffic collision and/or throughput issues. This can be done easily with a WiFi analyzer such as this www.inssider.com Once you’ve performed this operation, you will simply select the frequency and channel with the least amount of traffic on it in the setup utility of the ClickShare base station. This will ensure the best performance for not only reliable connectivity but will also provide the highest audio/visual playback and content sharing experience for the customer. Be 100% certain you are installing a ClickShare system running the latest firmware. The iOS and Android apps do not like it when they are trying to connect to a ClickShare base station running old firmware. More importantly, you will want to take full advantage of new feature sets as they become available. Plus it has been my experience that Barco does an excellent job of not breaking more things then they fix when releasing a new firmware rev. I wish I could say that about other companies! On larger deployments be sure to stagger your units. In addition to what I describe in #2, if you have a project where you will be installing more than just a few units, say 4 or more, do not leave all the units running on the same frequency and/or channel. As an example, the CSM-1 by default comes out of the box on the 5Ghz frequency/channel 36. You would not want all your units running as such. Stagger them between frequencies and channels ensuring maximum throughput. The ClickShare system does not channel hop. It will only deviate to a different channel or frequency by someone physically making the change to it in the setup utility. Please post your take on what your experience has been so for and if you can further expand on what I wrote above. We’d love to hear from you. I thought I would take this opportunity to post an article that I thought was very insightful as to the impact on the demand for collaboration for the next generation. It was written by Patrick Lee, VP of the Entertainment and Corporate group at Barco that manages the ClickShare channel of business. I think he hits the nail right on the head when he wrote about the “social knowledge-sharing paradigm” and its impact on the need for people to seamlessly share what they want, when they want to regardless of device, locale or setting. With this freeform approach to sharing comes real risk, especially on the security side. And when I considered those challenges and then wash them against the Barco ClickShare technology design addressing those challenges, I really gained a whole new respect for how forward thinking and yet almost ridiculously simple the Barco ClickShare technology squarely hits the mark. I urge you to take the time to read it and post your thoughts and opinions here in our blog spot. This is not a Barco ClickShare commercial. This is a bona fide – I see the light – cue the choir – testimonial! If you haven’t seen Barco ClickShare, you can’t appreciate the simplicity with which it solves a myriad of problems, including those of the aforementioned story. Our control system BDM Jamie Finnegan can explain it so eloquently. We have demo units you can borrow to experience it for yourself. Try it, you’ll never want to use anything else. Looking into our conference room, I’m wondering where our Barco ClickShare unit is (probably out on demo loan). I’m calling the warehouse today to get a permanently unmovable unit. We practice what we preach – now cue the choir!